Its TV ads imply that “After Earth” is an action thriller about a father and son who are both on the run in a future Earth that’s fraught with evolution-gone-mad perils, but don’t be misled. This is actually a classic coming-of-age adventure story about a scared but determined boy (Jaden Smith) who is on his own for most of the movie, while his immobilized military-hero dad (Will Smith) communicates with him from their crash site. That means most of the movie’s weight rests on the younger Smith’s narrow shoulders as a struggling military cadet named Kitai. He does a good job of seeming unsure and afraid yet determined to carry out his literally life-or-death mission. If Kitai doesn’t locate a rescue beacon that’s several days away by foot, both he and his father will die. On the way, he has to deal with potential predators both natural and very unnatural. The deadliest is a monstrous alien life form the ship was transporting to a training base, but which has escaped into the wild. 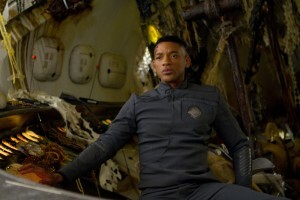 What quickly becomes apparent is that although “After Earth” has spaceships, a high-tech “cutlass” device that turns into multiple sharp-edged weapons and all kinds of snazzy computer graphics, at heart it’s the same timeless tale that could be told about a caveboy, a spear and a bear in the woods. Driving that point home (zing!) is the screenplay’s refusal to provide the military ship with anything resembling a gun that could kill from a distance. The movie’s only pure fantasy element, in fact, is one that actually detracts from the story. In the same way that the telepathic Force in “Star Wars” seemed like a mystical cheat, characters in “After Earth” can become invisible to the vicious alien life form by hiding all of their fear. What works as a metaphor is shakier in the execution. It’s hard enough to believe that an untested and frequently skittish teenager could keep his cool around something that big, scary and fast-moving. But it’s impossible to believe he could will himself to “ghost” by putting aside every bit of his completely understandable terror. Fortunately, that flaw isn’t enough to spoil the story. Director M. Night Shyamalan keeps things moving at a not-too-fast but not-too-slow clip once Kitai starts his journey. The natural scenery is so lusciously shot that the abandoned Earth looks like a paradise, which is a switch from standard SF post-humanity dystopias. 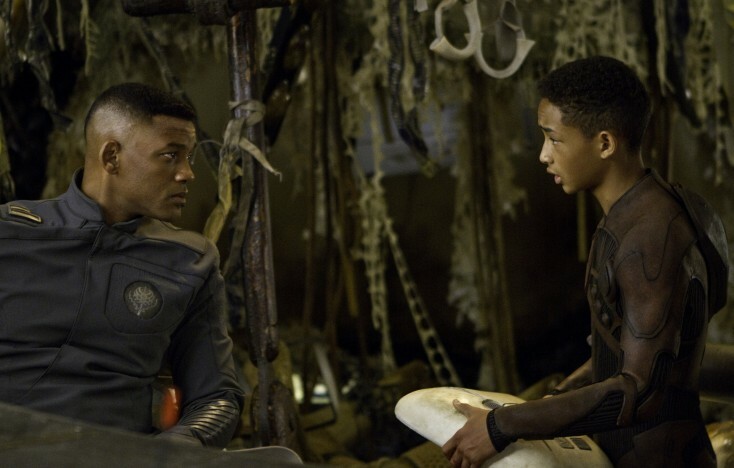 Unlike superhero blockbusters, “After Earth” has the benefit of being about something other than people beating each other up. That makes the movie more kid-friendly than those comic-book punch-ups. Although Kitai is forced to kill, the violence here is on a more personal scale that doesn’t involve global terrorism, mass-murder or overwhelming destruction. Also, Kitai’s something-to-prove relationship with his father has a classic feel that’s familiar without being annoying. Will Smith plays against type as a stonefaced, seemingly emotionless hardass who displays Vulcan-like stoicism even when performing surgery on himself. The last thing dutiful dad hears from his adoring wife before what will turn out to be a life-altering journey is that he and his son should “go make some good memories together.” Mission accomplished.